Peugeot scooters are the most popular powered two-wheeled transport in the UK. And now they claim to be adopting car-style values with big moves on quality control and technology. No wonder their scooters are sprouting roofs and windscreen wipers. Peugeot Motocycles boss Gérard Pressouyre took over the running of the division in early 2001, and claims the new Elystar 50, 125 and 150 versions mark the beginning of a major transformation. Pressouyre’s main commitment is to embody Peugeot car principles into the scooters, which he says are reliability, value for money, innovation, environmental friendliness and attractive styling. The new scooter does boast some impressive technical features, including two new braking systems with ABS, power assistance and front/rear linking on the 125 and 150 models. 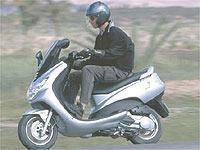 Many inexperienced scooter riders use the rear brake for fear of locking the front, and even then not firmly enough. Squeezing the levers on the Elystar has a dramatic effect in comparison with other scooters, as it hugs the road and sheds speed with truly impressive efficiency. If you try really hard it’s possible to lock the rear wheel (the ABS only operates on the front) but even with it sliding, stability is still exemplary. The 50cc Elystar has a simpler arrangement where the left bar lever operates front and rear discs at the same time – a pressure relief valve prevents early rear lock-up in the dry. This also works well once you learn not to pull the right hand lever, which operates a separate caliper on the rear disc – this is purely for emergency use in case the main system should fail. The engines too are advanced. The 50 is powered by a direct injection two-stroke which uses the same technology as Piaggio’s Hi-Per2 engines, invented by Australian firm Orbital. Emissions are down by up to 65 per cent and fuel economy improved by 36 per cent, according to Peugeot. The engine feels smooth and strong for its capacity, although initial pick-up could be better. The 125/150 four-strokes have conventional fuel injection which gives 30 per cent less emissions compared with the carburettor version in the existing Elyseo and 10 per cent better economy. The 150 feels usefully torquier than the 125. Both offer performance at the top end of the class. Although the 125 Elystar, likely to be the best seller, is up against Piaggio’s 125 X9 in the upper end of the market, it’s considerably more compact to look at with pleasing, sophisticated styling. It doesn’t seem likely that build quality can match that of the firm’s cars just yet. The seat hinge for example is flimsy and unconvincing, while the mirrors are cheap, with distorted images and inadequate adjustability. The Sun, a roofed version of the Elystar to compete with the Benelli Adiva and BMW C1, will arrive before winter. The quickly-detached roof offers no claimed safety advantage (unlike the C1).